L.F. Jennings was honored with two NAIOP DC|MD awards at the Association’s annual Awards of Excellence Gala on Wednesday October 3rd. 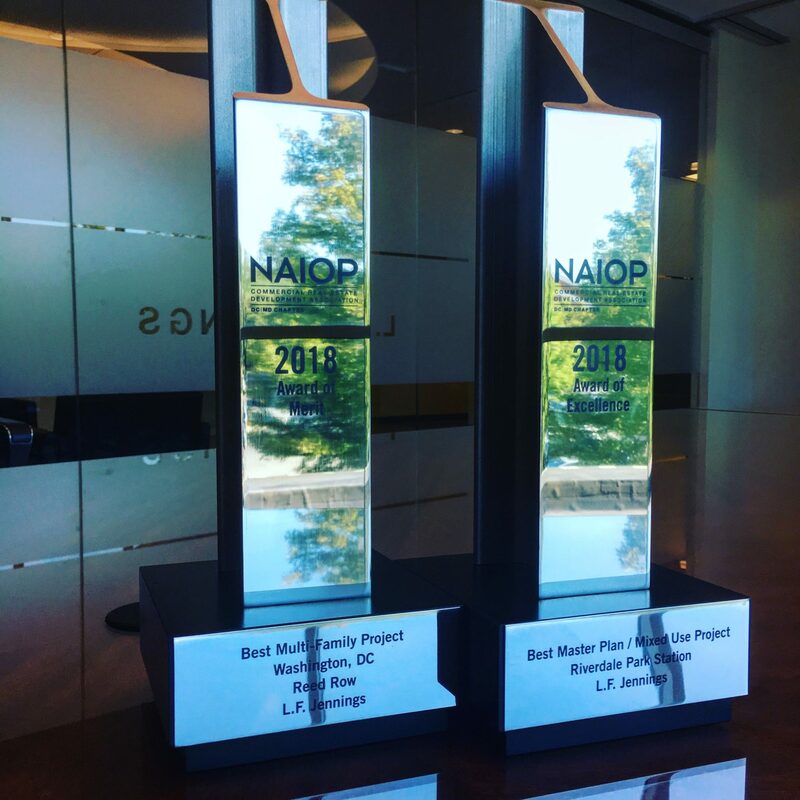 L.F. Jennings received an Award of Excellence for Best Master Plan/Mixed Use Project for Riverdale Park Station, and an Award of Merit for Best Multifamily Project in Washington, DC for Reed Row. Phase I of this development consists of a 150,000 SF Whole Foods Market anchored retail development, site amenities, and both surface and structured parking. Phase One also included extensive site work for parking and public amenities like splash park, benches, and art installations. Riverdale Park Station was given an Award of Excellence for Best Master Plan/Mixed Use Project. Congratulations to Calvin Cafritz Enterprises and MV+A Architects. Reed Row is an urban infill building located in Washington, DC’s Reed-Cooke neighborhood and features 132 loft style residential units, concierge lobby, fitness center, common area, communal workspace, rooftop deck, private courtyard, and 48 below grade parking spaces. The luxury apartment building offers a range of studio, one, and two-bedroom, and English basement units, as well as two-story “penthouse” units with private rooftop decks. This project successfully fulfilled its goals of creatively maximizing use and build a sustainable development on a challenging urban with site-height limitations, successfully navigating and obtaining input/approvals from several neighborhood groups during the design and construction process, addressed site adjacency/access limitations created by neighboring electrical substation and construction to the Marie Reed Education Campus which partially wrapped around the development, and successfully re-used an existing below-grade structure. Reed Row was awarded a Merit Award for Best Multifamily Project, Washington, DC. Congratulations to Kettler and R2L Architects.